"Mendes, king of the Egyptians, had a tomb built for himself that became known as the Labyrinth, less remarkable for its size than for the inimitable ingenuity of its making. Indeed, anyone who entered the tomb could not easily find the way out again unless guided by someone who knew it perfectly." History tends to be the history of the winners, with the losers assigned the passive, largely unvoiced, faceless role of the people on whom the winners operated. We reached the deep-flowing ocean where the Cimmerians have their lands and their town. This people is hidden under clouds, in mists that the sun's bright rays have never pierced. In the sixth regnal year the worship of the Aton was established as the religion of the state. Henceforth not only the Egyptian but the subject Nubians and Asiatics as well were to serve this one god alone. The temples of the other divinities were everywhere closed and their property seized. Whoever bore a name compounded with that of Amun was obliged to change it, and the king himself was among the first to do so. For a thousand years it was believed that the legends of the buried cities of Pompeii and Herculaneum were myths: they were spoken of as "the fabulous cities." For a thousand years the educated world did not credit the accounts given by Herodotus of the wonders of the ancient civilizations of the Nile and of Chaldea. He was called "the father of liars." Even Plutarch sneered at him. Now, in the language of Frederick Schlegel, "the deeper and more comprehensive the researches of the moderns have been, the more their regard and esteem for Herodotus has increased." King Arthur . . . It has long been said, in many languages, that if there is one aspect most universal about humanity, it is that we are story loving beings. The overwhelming evidence for this is the vast heritage of mythology, legend and folklore which emanates from the heart of every culture on earth, dating back to the earliest records of human history. That which makes us unique however, is our personal preference in story. We each loan our imagination to certain tales over others. The reasons for our distinct tastes are very often, not consciously known to us. In time, we learn that there is no wrong choice, when we follow, in faith, that which captures our heart. If Life itself, is like any one type of story, it is most like a Mystery. Within the many cycles of existence can be found comedies, love stories, tragedies and adventures. Yet, at the center of each, and very often, at the finish, we find pervasive mystery. Far back into prehistory, the earliest forms of religion, the world over, revered and celebrated this mysterious aspect of life. Even today, we still refer to these early beliefs as the Mystery religions. 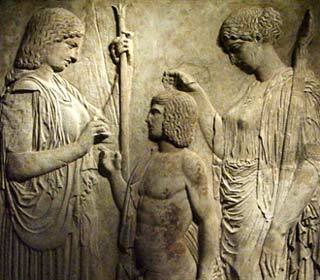 Rituals often included the reenactment of scenes from myth involving a hero's interaction with the forces of life. The stance of participants within such rituals was not to fear, but rather, to inhabit the mystery. Image above: Mural of Eleusinian mystery rite, depicting the goddess Demeter with her daughter Persephone. Eleusis, Greece, 5th century BCE. Today, we seldom worship the mysterious. Still, we are drawn toward and often mesmerized by that which is beyond the reach of our knowledge and understanding. We all, love a good Mystery! It doesn't necessarily need to be fiction, either. There is much about the real world which remains to be conclusively explained. 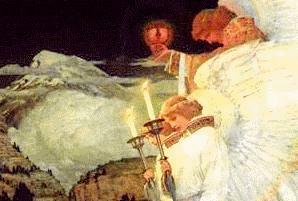 The lure of this unknown inspires each generation on to further exploration and revelation. New discoveries are made continuously in archaeology, genetics and a range of other fields. "The work of the spade has now brought out the essential underlying truth of the old traditions that made Knossos the most ancient culture of civilized life in Greece and with it, of our whole continent. No equal plot of Earth's surface has been as productive in such various directions of so many unique records bearing on our earliest culture." relating the advances of 40 years of discoveries on Crete. The ancient city of Petra; carved into the living stone cliffs of Jordan. There is no doubt that these advances increase the understanding of our world, and its inhabitants. Yet, paradoxically, they also reveal to us the scale of ignorance regarding what we know of our own nature and history. At times, it seems we are only lately beginning to understand who we are, and what our place is in the Universe. The more we learn, the more we realize how much remains to yet to be learned. This holds true even though the quest for understanding has been a devoted pursuit for thousands of years. Every child approaches life with a desire to know...to learn about the surrounding world. For each, the legacy of all that has been learned, is perceived anew. The movement of life is fluid and the landscape of history ever changing, so that every generation stands upon raw investigative ground. Inspired speculation, tempered by disciplined study proves to be the key to a broader encounter with the story of this world and its inhabitants. Of great value to contemporary explorers of history, are the fruits of those who have passed this way before us. Seeking answers in the past from contemporary perspectives does not equate to disregarding previous research and discovery. On the contrary, past efforts are the very foundation for future investigation. However, it is fair to suggest that along with the discerning analysis of a scholar, serious explorers maintain the improvisational openness of a curious child as they seek. "One of the most impressive and touching sights I have ever seen was this grand pyramid bathed in the light of the moon!" describing the Maya site at Tikal in Guatemala, 1906. The Mexican Indians drawing mazes hold them to be an expression of a universal plan of creation, and they may well be very right. The geometry on which this form of maze is based implies a concept of number and space with which we seem to have lost touch. To explain the workings of this number geometry in its simplest terms would be to say that it is a way of integrating the seventh and eighth divisions of a circle upon squares. This entails a rhythmical approach to number and shape that can be applied at one extreme to atomic structure and at the other to the stars. Fifteen centuries before Abraham settled in Bersheba and five hundred years before the pyramid age in Egypt, a foreign population entered Palestine from the northeast. These pastoral people, who probably came from the steppes bordering the Syrio-Arabian desert, became the first dwellers in the Negev, the southern, semiarid region of Israel. Their remarkable settlements, dating back more than 5,000 years, have been uncovered at Safadi and Abu Matar, near Bersheba. The villages constructed by these people were entirely subterranean. They are composed of extensive caves dug straight down into the alluvial soil on the banks of the Wadi. The discovery of this troglodyte way of life could finally explain the cave-dwelling Horites whom biblical scholars were always surprised to find mentioned as living in the caveless part of the country. The purpose of Lost and Forgotten Histories is to organize and support rational investigations into the vast collection of mysteries that make up what we do not know about the history of our world. This work is an exploration for ourselves, as well. For, Earthlore is not proclaiming to know the answers to these many mysteries, nor are we promoting any specific philosophy or agenda. The group of researchers, writers and artists gathered together for these projects are inspired by their own interest in the featured subjects. The potential of this medium for in-depth study and interactive discussion and debate combined with supportive computer programs is also a primary motivation for initiating this resource. Researchers will always be working over the questions, and verifying the validity of what is revealed. On certain themes we will be asking for the participation of viewers around the world in helping to evaluate theories and approach solutions. Throughout our efforts we will always establish a solid foundation by working directly with specialists from the fields of featured subjects. The results of this collaboration will regularly be made available. For the most part, what we are doing here is presenting information on specific subjects, such as: the decline of Maya Civilization. This topic has been hotly debated since the rediscovery of city centers within the jungles of Mesoamerica. Theories have ranged from widespread disease or internal warfare, all the way to extraterrestrial abduction and inter-dimensional migration. Clearly, everyone cannot be right. Still, the intent here is not to attack any theory, no matter how improbable, but rather to provide reference material and forums which encourage and support the ongoing process of inquiry. Conclusions are for you to determine. Our aim is to present the many puzzle pieces of world history. We intend to do this in an objective and balanced format. With 'millennium fever' still running rampant, there are countless theories being put forth on several important chapters of history. Our inspiration for this series of projects rises from the need for sanity and some sense of methodical order in this ever evolving process. Is there any relevance today for verification of a historical King Arthur hidden in the mists of legend? Are there lessons in studying the decline of ancient Peruvian civilization? Here, you can decide for yourself. We will be working to put a spotlight upon as many documented sources as possible. Through the powerful referencing utilities of the Internet, we will offer guidance for as much supportive material as is available. On each subject, we will be working directly with individuals who have invested substantial time and resources investigating these subjects. In the coming months we will be setting up forums and interactive projects linking researchers throughout the world. If you would like to be notified of the progress of these works - or become actively involved in contributing theories or material - you may contact Earthlore directly from these pages. All queries are confidential. Where appropriate, we are establishing reference data bases in association with existing research organizations. For certain projects, we are maintaining direct links with archeological sites to monitor and document the latest findings on a featured subject. Report information will be made available on an immediate basis, through Earthlore on-line and its associated organizations. Where possible, direct interaction with specialists on featured subjects will be provided for visitors through secured sites. A current feature is a series on the enigmatic Egyptian Pharaoh Akhnaton. There are more than a few mysteries surrounding this significant figure in history. Theories and opinions about his true story abound in great number. Yet, despite what is not known of Akhnaton, there exists a great wealth of hard archaeological material which is currently being studied and reintegrated into a more complete body of reference. 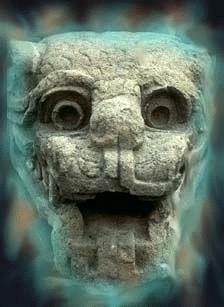 Akhnaton remains one of the most puzzling figures in ancient history. His dynamic sundering of long standing Egyptian tradition to found a religion based on a singular deity, sets him as the first monotheist in recorded history. Despite reigning at the height of the dynastic age, all memory of Akhnaton and his family would be lost for more than three thousand years. This vanishing followed an extensive suppression of the pharaoh's record by succeeding dynasties. It would not be until excavations of the late nineteenth and early twentieth centuries, within our era, that his name would be heard again. Rarely in history has such an extensive censorship been so successful. This fact alone prompts several important questions. What is certain, is that the reconstruction of Akhnaton's period will continue for a long time to come. We begin our efforts by providing a groundwork of information on what has already been rediscovered, as well as the outline of several theories surrounding the pharaoh. Some of these ideas are controversial, as is natural with uncertain histories. Once again, we are not setting ourselves up as judge and jury, we are gathering and presenting varied materials in an objective light. All are candidates for possibly until conclusively disproven...of course, with certain cases, this will not take very long. Explore this variety of views and determine the outline of your own. If you wish to, feel welcome to share these with us! Mention King Arthur, and the name conjures up a romantic image. The image is richly complex, comprising not merely a single character but a group, and a constellation of themes. Beside the King stand his Queen, Guinevere, and his enchanter, Merlin. Their home is Camelot, the royal city of a mysterious, wonderful Britain. It houses the Round Table, where Arthur presides over a company of knights, headed by Lancelot, devoted to the noblest ideals. In war he quells his enemies with a magical sword, Excalibur. If we explore the scene more deeply we see a brooding tragedy overhanging it. The King's reign is only a "brief shining moment", he is doomed to be plotted against, betrayed and brought down. Camelot must fall. There is more to this than a vague sense of charisma in high places. King Arthur is a figure of a specific kind. People saw Kennedy, with however little precise awareness, as a figure of a similar kind. Following Akhnaton is another ongoing investigation, also fascinating, in certain aspects, also controversial. These are the series of legends at the very heart of Western spirituality, surrounding the Holy Grail. Is there any historical evidence which validates the assertion of a material grail? Some say there is. Yet, in approaching such an exploration as the Grail of Christ, one must enter into the realms of myth, spirituality and symbol as countless other seekers have done for many centuries. Many other topics will be introduced through this series as they become relevant to existing projects. Some subjects, such as the meaning of the Labyrinth symbol, have a universal role to play, and will be added progressively. Generally, it will be clear why certain subjects were chosen, in relation to other investigations. Still, we promise you a few interesting surprises along the way. News Reports are made available through e-mail, containing regular updates on the status of all the Mystery projects. These are provided free of charge to interested viewers, and are easily discontinued if so desired. Mohammed Adh-Dhib had lost a goat. The lad was a member of the Ta'amireh tribe of semi-Bedouin who range the wilderness between Bethlehem and the Dead Sea, and he had been out all this summer's day tending the animals entrusted to his care. Now one of them had wandered, skipping into the craggy rocks above. Mohammed pulled himself wearily up the limestone cliffs, calling the animal as it went higher and higher in search of food. The sun became hotter, and finally the boy threw himself into the shade of an overhanging crag to rest a while. His eyes wandered listlessly over the glaring rocks and was suddenly arrested by a rather queerly placed hole in the cliff face, hardly larger than a man's head. It appeared to lead inwards to a cave, and yet was too high for an ordinary cave entrance, of which there were hundreds round about. Mohammed picked up a stone and threw it through the whole, listening for the sound as it struck home. What he heard brought him sharply to his feet. Instead of the expected thud against solid rock, his sharp ears had detected the metallic ring of pottery. He listened a moment, and then tried again, and again there could be no doubt that his stone had crashed among potsherds. A little fearfully the Bedouin youth pulled himself up to the hole, and peered in. His eyes were hardly becoming used to the gloom when he had to let himself drop to the ground. But what he had seen in those few moments made him catch his breath in amazement. On the floor of the cave, which curved back in a natural fault in the rock, there were several large cylindrical objects standing in rows. The boy pulled himself up again to the hole, and holding on until his arms and fingers were numb, saw more clearly this time, that they were large, wide-necked jars, with broken pieces strewn all about them. He waited no longer, but dropped to the ground and was off like a hare, his goat and flock forgotten in a frantic desire to put as much distance between himself and this jinn-ridden cave as possible. For who else but a desert spirit could be living in such a place with an entrance too small for a man? Contribute your thoughts to Viewers' Views!  Did the ancients possess technologies of which we are still unaware today? Your View!  Was King Arthur a historical figure or is he purely the stuff of legend? Was/is there a physical Holy Grail? Your View! The republication of content, without license, is an infringement of Copyright laws.